Mark your calendar! 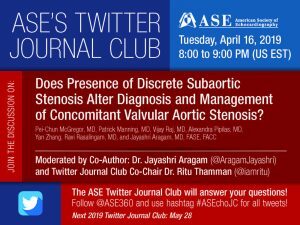 Interact with your colleagues in our next Twitter Journal Club on Tuesday, April 16, from 8:00 – 9:00 PM US EST as we review Does Presence of Discrete Subaortic Stenosis Alter Diagnosis and Management of Concomitant Valvular Aortic Stenosis?, from ASE’s case reports journal, CASE. Follow @ASE360, and please plan to join ASE’s journal club. Be sure to use the hashtag, #ASEchoJC, for all tweets. Click here to find out when the Twitter Journal Club is taking place in your timezone. If you have any questions on this event, please contact Arissa Cooper at acooper@ASEcho.org.